The sleek, new design of the SuperEar® Plus increases ambient sound gain 50+ decibels and picks up sounds up to 100 yards away using a multi-element, high sensitivity microphone. Super Ear Plus 7500 is perfect for watching television or getting the most from the theater, meetings, lectures, worship services, or simple conversations. 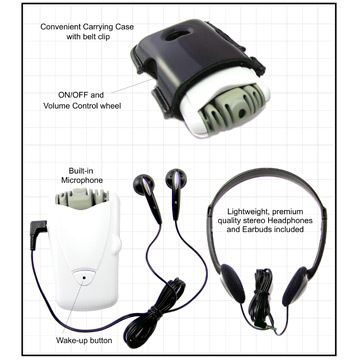 As an Assisted Listening Device, the SuperEar® Plus is also ADA (American with Disabilities Act) compliant and assists in CMS MDS 3.0 Compliance Newly redesigned microphone and carrying case help eliminate annoying case noise. Unobtrusive earbuds are easily camouflaged in public. Comfortable stereo headphones (also included) are great for home use. Laboratory tested to the highest standards, the SuperEar® Plus increases ambient sound gain by more than 50 decibels and picks up sounds from up to 100 yards away using a highly sensitive microphone. Stylish design weighs just 3 ounces, measures 3.05 x 2 x .75 inches.